Surely an event not to be missed.... Over the last few years these revisionists appeared to have largely retreated back whence they came. So who will cough up the cash to spend an evening, or two, in such esteemed company? Last edited by Saoirse go Deo; 21-07-2017 at 06:49 PM. Sounds like torture to me , Saoirse. 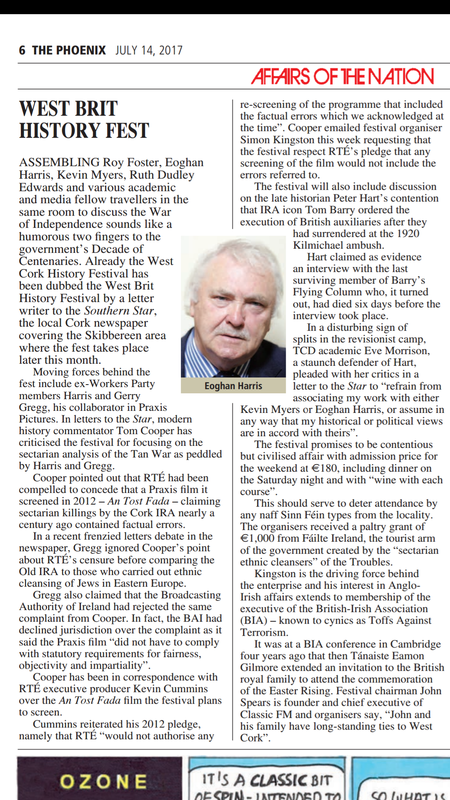 The West Cork Literary festival isn't far behind it. Two friends of mine , both retired teachers attended an event where Ruth Dudley Edwards was a speaker. The ladies had never heard of her and so had no preconceptions. Nonetheless , after ten minutes of Unionist vitriol , they felt compelled to leave. Being polite teacher types , they feigned an urgent need to use the bathroom. I don't think I could have been so polite! What has West Cork done to deserve this? Perhaps they were encouraged by the fawning reception Britain's monarch received? Hard to credit that these dinosaurs are still tramping about. They'll all be dead soon, don't worry. Haven't been following the President Trump and US presidential election threads then? The motley crew speaking at this event deserve contempt. A "different perspective" is the understatement of the century. I suppose the Orange Order just have a "different perspective" on catholics? I'm not entirely sure if Ceannaire was being serious, but assuming he/she was, his/her post doesn't really deserve a considered response, except perhaps to note that if he/she has only just noticed that An Phoenix is relatively republican in outlook compared to the rest of the grovelling, servile, self-hating, crypto-unionist Irish meeja, then he/she has not been paying attention. I like Ceannaire a lot as a poster and would have no issue with his/her point if the headliners at the gig were well intentioned peaceniks, but that's not the case. I suspect there's a bit of the old Workers Party passive-aggressiveness at play. I agree that the headliners at the 'gig' are very far from being well-intentioned peaceniks. They are - whether knowingly or otherwise (one always has to allow the possibility, however slight, that they are just stupid, or are so far down the route they have taken that they are too old to repent) shills for violent and murderous state terrorism, for war crimes committed by a foreign power in their own country and on their own fellow citizens. Yes, this is all correct, behind the tongue in cheek nature of my earlier posts in this thread is a serious point - namely that the attitudes and stances of these characters should be challenged.